It provides one-stop solution for converting videos, decrypt/copy/rip BD/DVD for sharing on NAS, Motionbox, YouTube, HD TV, and more. The new iPad Air 2 will most likely launch in the fall. As a movie fan, it is an ideal device for watching HD movies. As we know, there is no Blu-ray drive with iPad. For movies, conversion is a solution to solve this problem. But many Blu-ray discs are encrypted and copy protected. For instance, a lot of guys maybe consider more about how to copy and decrypt MKB v46 Blu-ray to iPad Air 2. Actually, AACS can be listed in the most common ones of advanced BD-based copy protection technologies. MKB is one of the keys included inside the copying protection system (DRM) AACS to protect Blu-ray from being copied. Aunsoft Blu-ray video converter Ultimate has updated and now support decrypting the latest MKB v46, which allows you easily rip AACS v46 protected Blu-ray to MP4 for iPad Air 2, as well as other Apple devices and Android devices. The new version also supports BD discs with bus encryption. Besides, as a 100% safe program, the Ultimate adopts advanced installer with digital signature. Want to convert Blu-ray to iPad Air 2 with forced subtitle? It is also possible! Forced subtitles are common on DVD and Blu-rays to provide a better visual experience to display the characters when a foreign or alien language is spoken, a sign, flag or other text in the scene is in different language. The Blu-ray Video Converter Ultimate helps you easily get movies with forced subtitles so that you can enjoy the movie without unnecessary characters on screen. As a multiple video supported converter, the program can effectively convert MTS, MKV, VOB, EVO, TiVo, etc. The output formats are more than 50 kinds of types for different players and editing tools. Below is a step to step tutorial to rip MKB v46 protected Blu-ray to H.264 NP4 for iPad Air 2. If you are Mac user, you can turn to iMedia Converter for Mac. Insert your movie to disc drive, and click “Load Disc” button on Blu-ray Ripper interface to load Blu-ray from ROM; it also support importing Blu-ray ISO and Blu-ray folder. The program automatically decrypts the disc, so that you can convert video and edit video without copy protection. Click "Format" drop-down list to locate all the profile; choose "iPad". You can select "iPad Air HD Video (*.mp4)" or "iPad Air Full HD (*.mp4)", etc. as you like. Click "Conversion" icon that Aunsoft Blu-ray Video Converter Ultimate will copy AACS v46 protected Blu-ray to iPad Air at ultrafast speed. 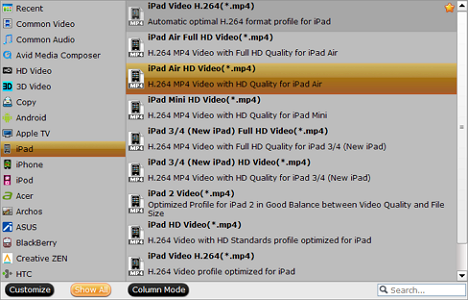 With just a click on "Open output folder", you can locate the export MP4 quickly. Excellent product! I love it. It is so easy and straight forward and I have so many options to choose from. Extremely fast...even with going to an external network drive. I purchased the software because it was able to show me visually what crop will look like and it was fairly straight forward. The program is very easy to use, seemed to be fast enough, quality is fine. And I do like your product as it rips blu ray to mp4 without any hassle.